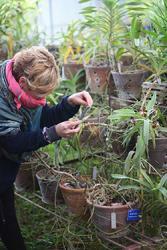 Işık identifying the Vanda species for paintingUsing art to communicate science can be an engaging way to discuss complex conservation topics. That’s why I am super excited to welcome Işık Güner, renowned botanical artist, to XTBG for a collaborative project focusing on orchid conservation. Isik and I are working together to develop an exhibit of botanical illustrations with the aim of reducing the over-consumption of wild orchids in China. 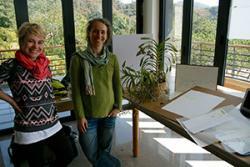 We are working with local artist He Rua Hua to combine both scientific and Chinese style paintings. 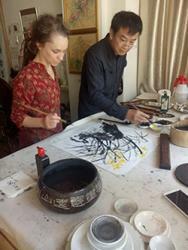 Sophie getting an introduction to Chinese ink paintings from He Rua HuaThis project will be a few years in the making and we are just at the start of the journey. Check back for updates as we progress towards a unique and world class exhibition.